Approximately 27,000 ceramic tiles cover the exterior of the NASA Space Shuttle. Acting as a thermal barrier to the 1650º Celsius generated by atmospheric re-entry, the tiles illustrate the impressive resistance of ceramic materials. The impressive properties of ceramics are also being used in bearings. Here, Chris Johnson, managing director of SMB Bearings, explains the specifications, capabilities and differences of full ceramic and hybrid bearings. Ceramics are primarily used in bearings due to the material’s corrosion and temperature resistant properties. Ceramics are inert, whereas metals are reactive, making ceramics resistant to corrosive materials such as seawater and many chemicals, including acids and alkalis. As ceramic bearings do not corrode, they require less maintenance than their steel alternatives and can be used in highly hostile environments. Unsurprisingly, these corrosion-resistant properties allow for ceramic bearings to be used in many industries, ranging from food and chemical production, to marine and underwater applications. However, there is some confusion. Often, what people refer to as ceramic bearings are actually hybrid bearings. So, what’s the difference between full ceramic and hybrid options? Full ceramic bearings have ceramic rings and balls and either a synthetic cage made from PEEK or PTFE or no cage at all. They are highly resistant to acids and alkalis and are therefore suitable for use in very corrosive environments. Silicon nitride (Si3N4) bearings can be heated to temperatures of 800º Celsius when used without a cage. Pairing these qualities with their light-weight nature, at 45% of the weight of steel bearings, they are incredible substitutes for traditional metal bearings. 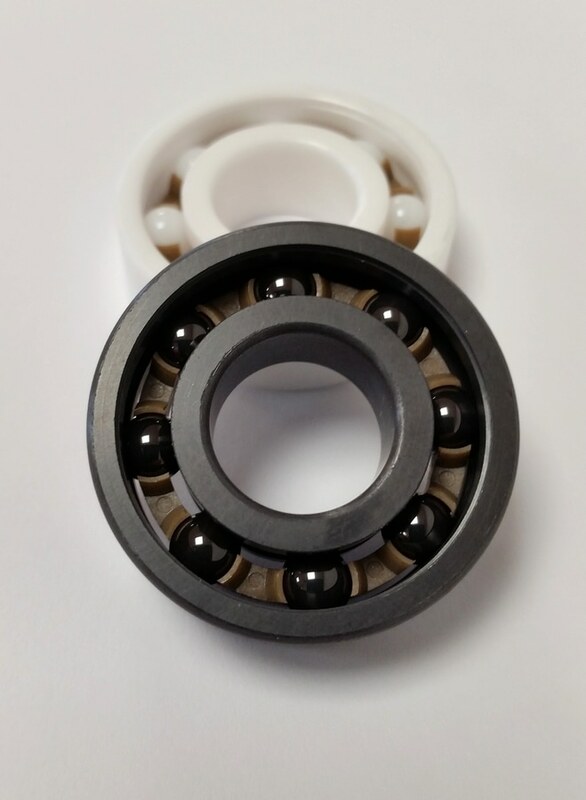 Full ceramic bearings are also non-magnetic, meaning they can be used in medical devices such as MRI scanners, or any application where there is a strong magnetic field. However, the greater hardness of ceramic bearings also means greater brittleness and as such, they do not tolerate shock loads well. When most people think of ceramic bearings, they are usually actually referring to hybrid versions. Hybrid bearings sit between full ceramic and steel options. 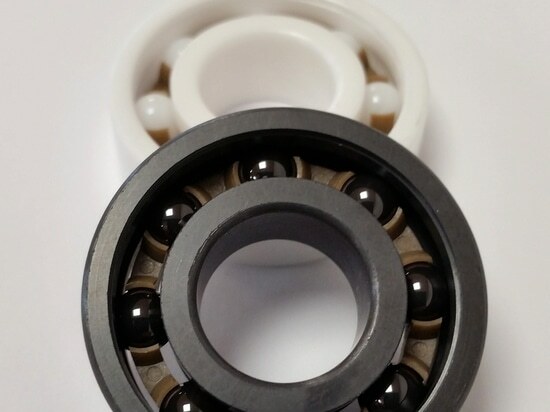 While they use ceramic balls, these bearings are paired with metal inner and outer rings. Using this combination allows for higher speeds than full ceramic options, as the less brittle metal rings are not as prone to sudden catastrophic failure under high speed or load. Despite the small difference in design, hybrid bearings’ requirements differ quite extensively from full ceramic bearings. For example, while full ceramic bearings do not require lubrication, hybrid bearings do. However, although the ceramic balls will still abrade the steel rings, hybrids will cope with marginal lubrication better than steel bearings due to the low friction coefficient and lightness of the balls. Lubrication may not be required when using hybrid bearings at very low speeds. However, as these bearings are often selected for higher speed applications than full ceramics, suitable lubrication is advised. Precision hybrid bearings with a high speed cage are capable of very high speeds hence their use in, for example, machine tool spindles. The corrosion resistant properties of the bearing are also affected when choosing a hybrid version over full ceramic. While the ceramic balls are highly resistant, the overall level of corrosion resistance is reduced due to the use of metal rings, even if they are stainless steel. Decisions on whether to choose ceramic bearings or hybrid bearings will come down to cost, the application and the hostility of the environment in which the bearings are to be used. While your application may not require ceramic bearings with the extreme temperature resistance of the Space Shuttle, a better understanding of the different types should make your decision a little easier.